What happens when an old dog sitting at the dinner table with his master slides a whole leg of lamb, a big bowl of posole, a stack of tortillas and a bottle of wine to a coyote, who just happens to be under the table? A whole ruckus, that's what! 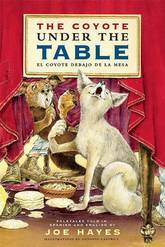 But that's nothing compared with some of the other wild and wonderful folktales gathered by author Joe Hayes in this bilingual edition of The Coyote Under the Table. Like his signature collection The Day It Snowed Tortillas, this book is full of lively characters and laugh-out-loud stories. There's a trio of unsuitable suitors who court a clever young girl and end up being scared out of their wits one midnight in a haunted church. And a greedy man who learns his lesson on a day when he couldn't stop dancing. And a spotted cat who is actually a guardian angel in disguise. Once again Hayes intrigues and amuses with this charming compilation. --Booklist These wise and witty tales continue to repay fresh encounters. --Kirkus Reviews Joe Hayes is a nationally recognized author and storyteller. Joe lives in Santa Fe, New Mexico, and travels extensively throughout the United States, visiting schools and storytelling festivals. Antonio Castro L. was born in Zacatecas, Mexico. He has illustrated dozens of children's books including other Joe Hayes classics P jaro Verde and The Day It Snowed Tortillas (Cinco Puntos Press), as wells as Barry, the Bravest Saint Bernard (Random House) and The Life of Louis Pasteur (Twenty-First Century Books). He lives in El Paso, Texas. Joe Hayes is back with another unbelievable, astounding, and totally true tall tale, straight from his own childhood in the Arizona desert. 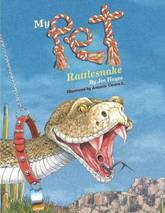 One day little Joe is out in the desert, walking around, and he sees a rattlesnake in trouble. Joe saves the snake's life! That's when things get weird. The rattler follows Joe home. My gosh! It's only a rattlesnake, nothing new for a desert boy like Joe, so he keeps him for a pet. His dad is annoyed, the neighbors are terrified, but soon the friendly snake slithers his way into their hearts. The snake cuddles at the foot of Joe's bed, plays in the yard, he even scares away a burglar and alarms the police. What a charmer! Is there really such a thing as cold-blooded love? Joe Hayes, a children's book writer and one of America's premier storytellers, loves telling tall tales from growing up in Arizona. Whether it's writing stories or telling stories from the tri-cultural American Southwest, Joe is always at home celebrating the imagination of childhood. The New Mexico Library Association named Joe the Centennial Storyteller in 2010, a storyteller so good he only comes around once every one hundred years! Antonio Castro L. was born in Zacatecas, Mexico, and has lived in the Juarez-El Paso area for most of his life. The illustrator of dozens of children's books, this is his fourth collaboration with Joe. He and his son book designer Antonio H. work on his books as a team. Kids always want Joe Hayes to tell The Gum-Chewing Rattler. And why not? It combines so many things kids love to do--chew bubble gum, tell tall tales, and drive their moms crazy--with the wild, impossible claim that a rattlesnake chewed gum and blew a bubble with it! You see, when Joe was a boy, that's what he told his mother--that bubble gum saved him from a rattlesnake's fangs! Really! Don't worry--Joe's mother didn't believe him either. In 2005, Joe Hayes received the Talking Leaves Award from the National Storytelling Network for his contributions to the literature of storytelling. Mam says she has the best daughters in the world. The two women live near their mother--Rosa with her husband and children, Blanca by herself. They both have flourishing gardens. Rosa and Blanca are so generous and kind and thoughtful--well, everyone, including Mam , ends up with too much corn, tomatoes, and red hot chiles! It's crazy! It's also Joe Hayes at his finest, telling one of those stories young kids love, full of mishaps, surprise endings, and happy mommas! In fact, one seven-year old--after hearing Joe tell Don't Say a Word, Mama!--came home and told her mother, I heard a story today that I think changed my life! That's a pretty fantastic endorsement! 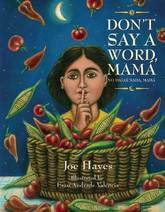 2014 Honor Book, Patterson Prize for Books for Young People Joe Hayes has been enchanting listeners and readers alike for over thirty years. 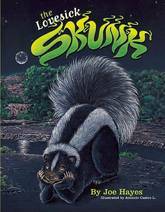 His books have received many awards including two Land of Enchantment Children's Book Awards and an Aesop Accolade Award. His books have also been on the Texas Bluebonnet Award Master List three times. Ghost Fever won the Texas Bluebonnet Award for 2006-2007. Esau Andrade Valencia comes from a family of folk artists. He is increasingly being recognized as a master artist in the tradition of Diego Rivera and Rufino Tamayo. His paintings are included in the collection of The Museum of Latin American Art in Long Beach, California, as well as in the Downey Museum of Art in Downey, California. So, you've been in trouble. Your -parents tell you they're calling the bogeyman. You laugh. There's no such thing!Then-you hear a sharp knock. Standing at the door is the oldest man you have ever seen. It's el Cucuy (coo-COO-ee)! With that big red ear, he hears everything!In this cautionary tale, storyteller Joe Hayes tells about two girls who didn't believe in el Cucuy until he snatched them up. Of course, the story has a happy ending.Joe Hayes has become one of America's premier bilingual storytellers. Hayes lives in Santa Fe, New Mexico. Illustrator Honorio Robledo grew up in Veracruz and Chiapas, Mexico. He lives in Los Angeles. 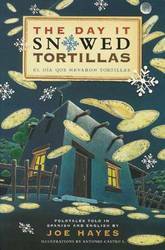 Kids of all ages are always asking Joe Hayes, How can it snow tortillas? 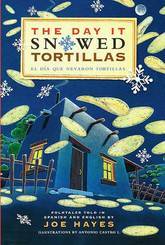 Well, now they'll know where to find the answer--at long last, Joe's signature book The Day It Snowed Tortillas is appearing in this new bilingual edition. 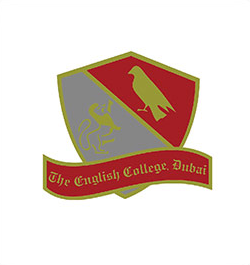 Bloomsbury Review listed the original English-only edition as one of their fifteen all-time favorite children's books. 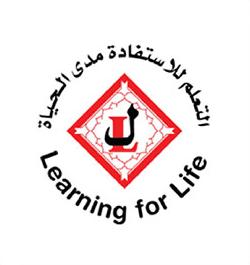 Our bilingual edition has all the original stories as they have evolved in the last twenty years of Joe's storytelling. It also has new illustrations by award-winning artist Antonio Castro. Storytellers have been telling these stories in the villages of New Mexico since the Spanish first came to the New World over four hundred years ago, but Joe always adds his own nuances for modern audiences. The tales are full of magic and fun.  In the title story, for instance, a very clever woman saves her silly husband from a band of robbers. She makes the old man believe it snowed tortillas during the night! In another story, a young boy gladly gives up all of his wages for good advice. 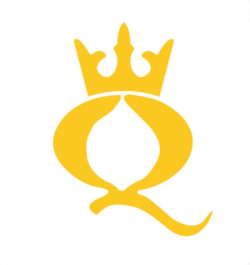 His parents think he is a fool, but the good advice leads to wealth and a royal marriage. The enchantment continues in story after story--a clever thief tricks a king for his kingdom and a prince finds his beloved in a house full of wicked step-sisters. And of course, we listen again to the ancient tale of the weeping woman, La Llorona, who still searches for her drowned children along the riverbanks. El Bloomsbury Review nombr la edici n original de este libro entre sus 15 libros favoritos de todos los tiempos. Cuentistas han contado estas historias en los pueblos de Nuevo Mexico desde que los espa oles vinieron al Nuevo Mundo, hace m s de cuatrocientos a os, pero Joe siempre a ade sus propias matices para audiencias modernas. Los cuentos est n llenos de magia y diversi n. En la historia titular, por ejemplo, una mujer muy astuta salva a su esposo de un grupo de ladrones. Hace que el viejito crea que nev tortillas durante la noche! En otra historia, un joven da todo su sueldo, con gusto, por buen consejo. Sus padres creen que es una locura, pero el buen consejo lo lleva a riquezas y un matrimonio real. El encantamiento continua de historia en historia--un ladr n inteligente estafa a un rey por su reino, y un pr ncipe encuentra su amada en una casa llena de hermanastras malvadas. Y claro, escuchamos el viejo cuento de La Llorona, quien todav a busca por la orilla de r os para encontrar a sus hijos ahogados. Joe Hayes is one of America's premier storytellers. He is especially recognized for his bilingual telling of stories from the Hispanic culture of northern New Mexico. Joe lives in Santa Fe, New Mexico and travels extensively throughout the United States, visiting schools and storytelling festivals. Joe Hayes es un cuentista preeminente en los Estados Unidos. Es especialmente reconocido por sus relatos biling es de historias de la cultura Hispana del norte de Nuevo Mexico. Joe vive en Santa Fe, Nuevo Mexico, y viaja extensamente, visitando escuelas y festivales de cuentistas. An entertaining marriage of pictures and words. 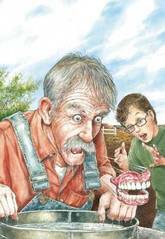 -Kirkus ReviewsIn 1996, master storyteller Joe Hayes and illustrator Rebecca Leer created A Spoon for Every Bite. It became an instant classic. In this lovely New Mexico folktale, a rich man tries to prove his wealth to his poor neighbors by using a new spoon for every bite. In the process, he's served a pretty dish of come-uppance. 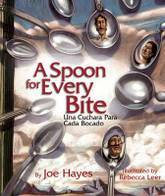 A Spoon for Every Bite is available for the first time in the bilingual format for which Hayes is famous.Joe Hayes is one of America's premier storytellers-a nationally recognized teller of tales from the Hispanic, Native American and Anglo cultures. 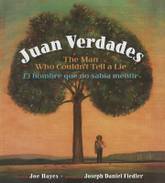 His bilingual Spanish-English tellings have earned him a distinctive place among America's storytellers. Mam says she has the best daughters in the world. The two women live near their mother--Rosa with her husband and children, Blanca by herself. They both have flourishing gardens. Rosa and Blanca are so generous and kind and thoughtful--well, everyone, including Mam , ends up with too much corn, tomatoes, and red hot chiles! It's crazy! It's also Joe Hayes at his finest, telling one of those stories young kids love, full of mishaps, surprise endings, and happy mommas! In fact, one seven-year old--after hearing Joe tell Don't Say a Word, Mam !--came home and told her mother, I heard a story today that I think changed my life! That's a pretty fantastic endorsement! 2014 Honor Book, Patterson Prize for Books for Young People Joe Hayes has been enchanting listeners and readers alike for over thirty years. His books have received many awards including two Land of Enchantment Children's Book Awards and an Aesop Accolade Award. His books have also been on the Texas Bluebonnet Award Master List three times. 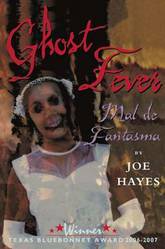 Ghost Fever won the Texas Bluebonnet Award for 2006-2007. Esau Andrade Valencia comes from a family of folk artists. He is increasingly being recognized as a master artist in the tradition of Diego Rivera and Rufino Tamayo. His paintings are included in the collection of the Museum of Latin American Art in Long Beach, California, as well as in the Downey Museum of Art in Downey, California. In his classic bilingual style, Joe tells the story of a haunted house in a poor little town in Arizona. Even when the landlord offers free rent, nobody moves in because they know a ghost lives there. That is, until Elena's father rents it. He doesn't believe in ghosts. Lucky for Elena that her grandmother knows all about the ways of ghosts. She helps her solve the mystery of the ghost on the roof while Elena learns a very important lesson about life. La Llorona (yoh-RROH-nah), now available for the first time in a full-color paperback, is the ghost story to end all ghost stories and truly the most popular cuento of Hispanic America. This story of the weeping woman appears at first to be only a frightening tale filled with mysterious events which cause children to sit wide-eyed. Yet it's the simple, universal wisdom at the core of the story that finally works its magic into their hearts.Joe Hayes is best known for his bilingual tellings of stories from the American Southwest. 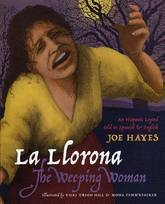 La Llorona is one of his favorite stories. A bilingual collection of humorous trickster tales, in which women pit their formidable intelligence to outwit villains, husbands, brothers, fathers, and sweethearts. From the kind woman who tricked two men who thought they had robbed her of a ham to the woman who saved her gold by tricking her foolish husband into thinking it had snowed tortillas, these tales cultivate lessons of honesty, goodness, hospitality, and honor--not to mention intelligence and wit to survive. As Joe Hayes points out, People the world over tell stories of a humble individual tricking an overbearing person of higher status, but the idea is especially cherished in Hispanic storylore. Making the trickster a woman adds spice to the trick. Joe Hayes must have had a singular growing up in the Arizona desert because he sure loves to write stories about it. And he tells those stories of his so much to audiences all over the United States that it seems like the stories just get more and more fantastic. 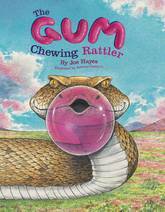 I bet you've already heard the first tall tale he wrote--The Gum-Chewing Rattler--about a rattlesnake who chewed bubblegum. Yes, it's true. That scary snake even blew huuuuuge bubbles. Now Joe has written a new story about his early years in Arizona. Joe, the kid, was a creature of habit. If he decided he liked to do something, he would do it over and over again. Like wear the same T-shirt until it nearly fell apart or use the same pencil until he'd sharpened it down to a nub. He also had a pair of black-and-white high-top sneakers that he loved to wear. He wore them every day. Get rid of those shoes, his mother told him one morning. They smell terrible! Did Joe listen? Not until he met the back end of a skunk. And this wasn't just an ordinary skunk, but one who was lovesick. But I'm not going to tell you who she was in love with. You'll have to find that out for yourself. Joe Hayes is one of America's premier storytellers, a nationally recognized teller of tales--true and tall--from the Hispanic, Native American, and Anglo cultures of the American Southwest. 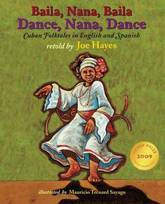 Joe Hayes received the Anne Izard Storytellers' Choice Award for Dance, Nana, Dance. In his acceptance speech, Joe talked about his hopes for his book: Someone has said that enemies are just people whose stories we don't know. I see a lot of truth in that. The more other people's stories are hidden from us, the easier it is for us to view them as enemies. But when we begin to learn their stories we recognize all we share in common with them and we delight in how the unique beauty of their traditions enriches our own lives. Respected raconteur Joe Hayes is built for tall tales-he's got the world's longest legs! And Joe-who travels all over the United States telling stories to kids-says that The Gum-Chewing Rattler is the perfect tall tale for kids because it combines so many familiar experiences-chewing lots of bubblegum, getting in trouble in school, driving your mom crazy-with the wild, impossible claim that a certain rattlesnake chewed gum and blew a bubble with it. Couple that with kids' natural fascination with poisonous snakes, and The Gum-Chewing Rattler turns out to be one of Joe's most requested stories.Joe's been telling this wild story for years, since before 1980, when he took those long legs of his out on the road. But now, that old gum-chewer is here for the first time in a picture book with full-color illustrations by Antonio Castro L.Here's how Joe's story goes: When Joe was a boy, he chewed lots of bubblegum, his mom got so mad because the gum in his shirt pocket made a terrible mess in the wash! But this wad of bubblegum just happened to save Joe from a rattlesnake's fangs!Really! !Don't worry-his mother didn't believe the story either. Kids today grow up knowing all about recycling. But when Joe Hayes was a kid, recycling hadn't been invented. Money was so tight for Joe's family that they had to be inventive about using and reusing everything. They didn't call it recycling, they called it making do. Joe says his family was dirt-poor. In fact, he says, they lived in a wide-open stretch of played-out land where even the dirt was broke, so impoverished that all anyone could manage to get out of it was beans. Beans and more beans, that's all folks grew and that's all folks ate. So imagine the family's delight when Joe's father turned up one day with a big fat hambone! There was rejoicing all over the place, especially at the dinner table that night. Joe's mother was determined to make that bone last as long as she possibly could. As thrifty as she was, she would have done just that except the neighbors got wind of the bone's arrival. Being neighborly, she just had to share that bone. That's when this Tall Tale got even TALLER. Joe Hayes is such a stylish raconteur that kids can't resist listening to him. Like that recycled hambone, generations of kids have been passing that Hayes and his books around and around, the kids now squeezing as much joy out of him as their mothers and fathers did before them. Hayes lives in Santa Fe, New Mexico, but travels all over the Southwest telling his stories. La Llorona (yoh-RROH-nah), the ghost story to end all ghost stories, is now available for the first time in a four-color, hardback edition. It is truly the best known and most popular cuento of Hispanic America. 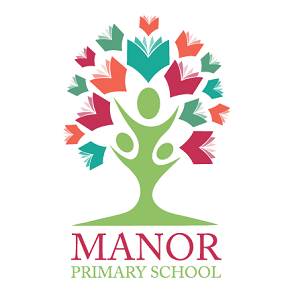 It appears at first to be only a frightening story filled with mysterious events that cause children to sit wide-eyed, to huddle together and listen spellbound. Yet, it's the simple, universal wisdom at the core of the story that finally works its magic in their hearts. 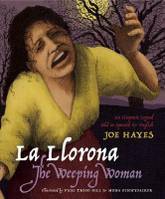 In the original paperback duotone version, this story of the weeping woman, sold close to 100,000 copies.Joe Hayes is best known for his bilingual tellings of stories from the American Southwest. La Llorona is one of his favorite stories. Pajaro Verde, the dream-like story of an enchanted prince and nine curious sisters, is now available in paperback. 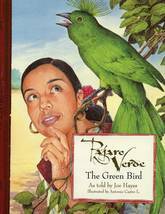 Winner of an IPPY award, Pajaro Verde tells of a green bird who proposes marriage to a young girl named Mirabel. She only has two eyes, but her sisters each have a different number of eyes, beginning with the oldest, who has nine, down to the youngest, with just one. Though they mock Mirabel and her mother forbids it, Mirabel's steadfast vision sees past the bird to a handsome prince, and she marries him! What happens next can only happen in a fairy tale!Bilingual storyteller Joe Hayes received an AESOP Accolade from the Children's Folklore Section of the American Folklore Society for Pajaro Verde. In this Cinderella tale from the Southwest, each of the sisters has an encounter with a magical hawk, but the heroine is kind to the bird and receives a gold star on her forehead. Her spiteful stepsisters go in search of their own gold stars but are rewarded with a donkey's ear and a cow's horn. You can imagine which sister the prince marries!The cloth version is in its third printing with more than 15,000 sold. Joe Hayes (Santa Fe, New Mexico) is one of America's premier storytellers. Nationally acclaimed for her folkloric style, Gloria Perez died of cancer before completing the illustrations, but she passed the task to her daughter Lucia Angela Perez (Fort Worth, Texas). The transition is wonderfully seamless.